The antenna reflector is a truncated paraboloid reflector of open lattice work construction, covered with a wire screen to reduce weight and wind resistance. The dual feed includes the primary radar section and an integral identification friend-or-foe antenna. The primary feed is a slot type, it has a tuned cavity and flared shape to ensure proper illumination of the reflector. The reflector then forms the RF energy into a fan shaped beam with a 19° vertical beamwidth and 10.5° horizontal beamwidth. The antenna has a gain of 21 dB at a sidelobe attenuation of 27 dB in azimuth. The solid-state transmitter architecture is highly redundant. It is predicted to have a 90 per cent probability of maintenance-free operation for 90 days with no more than 11 per cent projected reduction in radar range performance. The 112 transmitter modules are identical and interchangeable, as also are the power supplies. In the event of component failure, the system undergoes a gradual and graceful degradation in transmitter output. It remains fully operational and capable of detecting targets. The transmitter solid-state technology offers inherent tactical flexibility. For example, output power is adjustable. As a result, ships can reduce their susceptibility to detection while maintaining substantial air surveillance capability. If the tactical situation requires emission control conditions, the solid-state transmitter will respond instantly. Similarly the transmitter will immediately radiate at full power with just the touch of a push-button. Pulse-to-pulse frequency diversity is also provided. A unique automatic levelling control system greatly reduces the need for maintenance actions. This system automatically senses and compensates for degradations in transmitter module performance. The AN/SPS-40 is operational e.g. on Bangladesh Navy's ship Somudra Joy (Hamilton-class). 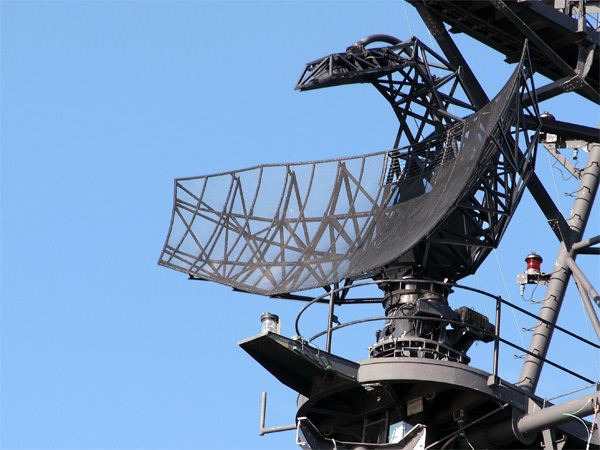 The most AN/SPS-40 radars are replaced by AN/SPS-49(V) radars in the late 1980s and early 1990s. AN/SPS-40D: modified 40A version with higher reliability, including a coupling equipment for the AN/SYS-1 system; manufactured by Westinghouse.